Painting the kitchen will help bring a much-needed sparkle back to it. 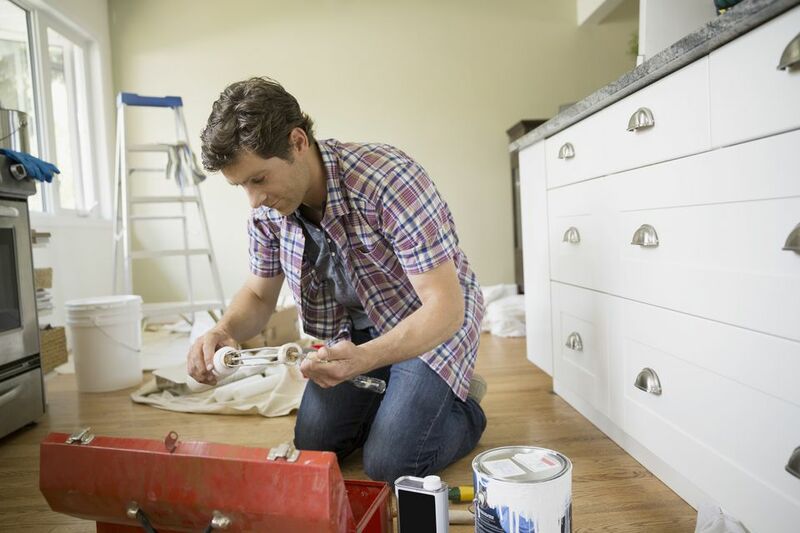 In some ways, painting the kitchen is an easier project than painting bedrooms or living rooms because the amount of wall space tends to be limited. Most of a kitchen's wall space is dominated by base cabinets, wall cabinets, and backsplashes. On the downside, the small area that remains to be painted usually needs extensive cleaning and prep work. For an unfurnished kitchen, use either a roller or a paint sprayer for the walls. For window and door trim, always use a brush. For a furnished kitchen, use a roller on the large expanses of wall and a brush for the little strips, such as between the backsplash and the cabinets. It is important to choose your kitchen paint colors wisely and with care since this is a room that gets a lot of attention. The best kitchen colors tend to have a high visual impact and align with the idea of food and eating. Think of paint finishes as you might the spectrum of colors on a paint fan. In this instance, though, the spectrum is not colors but gradations of glossiness: matte (flat, non-shiny) at one end and high-gloss (so shiny you can almost see your face) at the other end. Which is the best paint finish for the kitchen? Satin and semi-gloss tend to be favorites, while matte is rarely recommended because it is difficult to clean and beads of moisture will cause streaks. Figure out the square footage of your walls so you know how much paint to buy. Usually in a new-construction kitchen, the space will be devoid of everything but drywall. Calculate the square footage of each wall by multiplying room height (likely 8 feet) by room length (variable). Then add up all walls to get the total. For a kitchen remodel, the kitchen will be fully stocked with cabinets, appliances, flooring, and more. In this instance, you are dealing with far less square footage than in an empty room. Cabinets take up a majority of the wall space. One method is to imagine that it is an empty room and buy enough paint to cover all walls as if it were an empty room. The extra paint can be saved for those inevitable touchups. Unless you are dealing with an empty room with fresh drywall, kitchen walls will need a lot of cleaning. Assume that areas above and around the stove, oven, and counters need to be cleaned with warm water and TSP (tri-sodium phosphate). Door trim usually can benefit from the TSP cleaning, too. Remove dust and cobwebs from the tops of baseboards and other trim with a vacuum and a damp cloth. For the empty room with no finished floor, masking and covering is not needed. Paint drips on the subfloor will be covered up later by the floor covering. If using a paint sprayer, be sure to drape plastic over doors to adjacent rooms to prevent paint mist from migrating. For the finished room, apply masking tape to the trim before painting the walls. Lay a canvas drop cloth on the floor. Drape large objects such as cabinets, appliances, and tables with plastic sheeting or with masking film. If a surface has already been painted and the paint is in good, clean condition, it likely will not need priming. Unpainted drywall, bare wood, and painted surfaces in poor condition should be primed. Apply the primer with the roller on large areas and with the brush on areas too small to accommodate the width of the roller. Determine which areas are large enough to accommodate the roller. Pour a small amount of paint in the tray, soak the roller cover, then thoroughly roll out the excess. Roll these large spaces of wall in a W-pattern, covering sections of about 4 feet by 4 feet. Bring the roller to about an inch or two of the painter's tape. Let the paint dry for about two hours. Dip the paintbrush in the paint can and manually paint the areas that the roller could not reach. Avoid drips by minimally applying the paint and by re-brushing. Areas that were painted more than a few minutes ago will likely already be filming over. So, confine your re-brushing to areas that were only recently painted. Paint colors deepen and reach their full potential by being applied in two or even three coats. At a minimum, let the paint dry for at least a couple of hours, then re-roll and re-brush the paint one more time.